EE828WDC(BP) eLEDing, Green Energy, Microgrid, Dual Head Solar Light offers outstanding quality and reliability. Its distinctive wide range applications and engineered SMART lighting features provide lighting enhancements that are significantly beyond the level of current solar lighting technology. This newest generation light is equipped with two ultra-bright LED illuminators, unlike traditional old-dated LED illuminators, and they provide a brightness level equivalent of up to 50x50 W+ Halogen lamp. It operates under a software based Intelligent Power Management (IPM) system. It can be used for most lighting installations, replacement of AC lights, or backup lighting during AC power outages. It offers true Dusk-to-Dawn lighting with innovative SMART Dim-lighting profiles. It has built-in auto compensation for all weather conditions and variations of geographic locations. This light is embedded with an exclusive pure digital hybrid lighting engine. Max-brightness or dimming of Moonlight lighting is controlled with user adjustable dials. In SMART AUTO profile, it acts as a traditional motion security sensing light. It also can replace the traditional IR illuminator as a white light illuminator for video surveillance systems without AC power limitation and in darkness conditions it provides enhanced full color image vision. 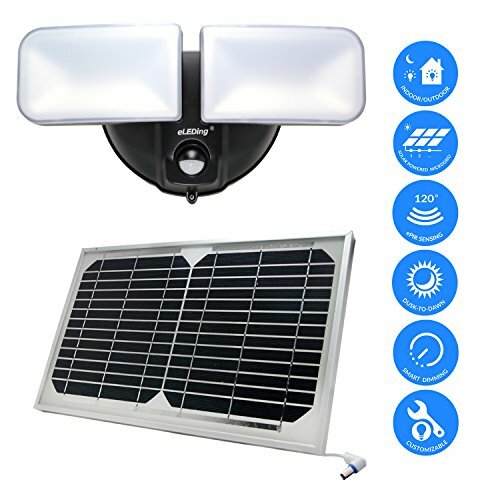 This is a highly efficient SMART solar light designed for residential, commercial, industrial, and recreational lighting. 【UPGRADED SOLAR FLOOD LIGHT OUTDOOR】Built with 3rd generation LED illuminator that produces up to 1200 Lumens of light output (when motion been detected), this fixture outperform traditional 120W incandescent lamp. Its two adjustable heads allow more flexibility for users to get precise illumination by combining or separating the light heads. 【TRUE DUSK TO DAWN MODE】SMART On provides moon light saving profile for dusk-to-dawn illumination. Supported by our exclusive Intelligent Power Management (IPM), this fixture is capable of all-night-long illumination under different weather conditions all year round. It makes your neighbors completely get rid of light pollution harass. 【WELL-BUILT COMPONENTS WITH HIGH DURABILITY】with long lifecycles, this waterproof IP65 light is built of heavy-duty polycarbonate (PC) light fixture and high-quality components, including Zilog MCU, EESGI-ePIR detector, 10W LED (5W for each head), 28WH Li-Poly battery, and 8W tempered glass solar panel with 10-feet-long cable (extendable for option). 【ONE STEP SETUP】with easy DIY and user-friendly settings, the fixture can replace most outdoor existing AC light and outdated solar light, and provide daylight white color temperature and 60'x60'+ light coverage area. Users can customize brightness based on their preferences. 【1 YEAR LIMTED WARRANTY】US-patented tech, US designed and QC. If you have any issues, please feel free to contact with us. Manufacturer: E E Systems Group, Inc. Publisher: E E Systems Group, Inc. Studio: E E Systems Group, Inc. If you have any questions about this product by eLEDing, contact us by completing and submitting the form below. If you are looking for a specif part number, please include it with your message.